Ruta Nacional Nº 144 Km. 674. Cuadro Benegas. Algodon Wine Estates offers, apart from the excellent production of wines, an 18- hole golf course, a prizewinning restaurant which makes delicious gourmet dishes prepared with regional products; beautiful wine tours and wine tastings, and an elegant lodge with rural style that provides its guests with modern facilities and an outstanding service so that they can feel “at home”. Those who visit Algodon Wine Estates will enjoy unforgettable horse and bike rides, and hikes contemplating the wonderful views and natural scenery that the region offers. The private gallery offers intimacy in the rest outdoors. The chimney that is found in each one of the environments gives heat and lukewarmness of the houses of long ago. The typical mendocino landscape penetrates in the gallery that surrounds the house, until arriving at the living room, rustic and intimate, with its traditional firewood. The library, the swimming pool with its solarium and the garden do summers be more fresh and hottest winters. The equilibrium between the natural thing and the present time permits, in this heavenly place, to be connected with the world through wireless Internet and satellite TV. The exclusive lodge rooms are located in two 1921 farm houses that still have some of their original characteristics, such as adobe walls and cane roofs. 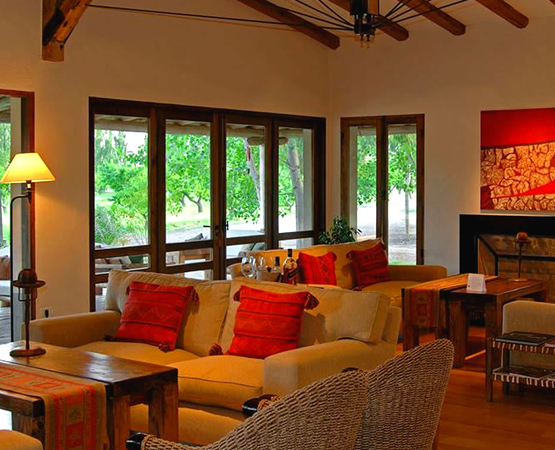 “Antigua Casona” has three spacious suites with chimneys and beautiful galleries. 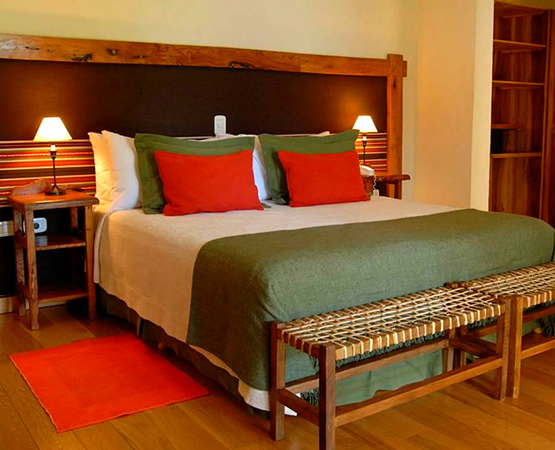 The lodge “Nueva Casona” is only some metres away from “Antigua Casona”. The former has been recently redesigned. Its 5 suites have been completely equipped and feature the greatest amenities that include: air conditioner, satellite TV, WiFi and central heating. Algodon Wine Estates´ restaurant is another attraction which specializes in making the most delicious dishes prepared with regional products. 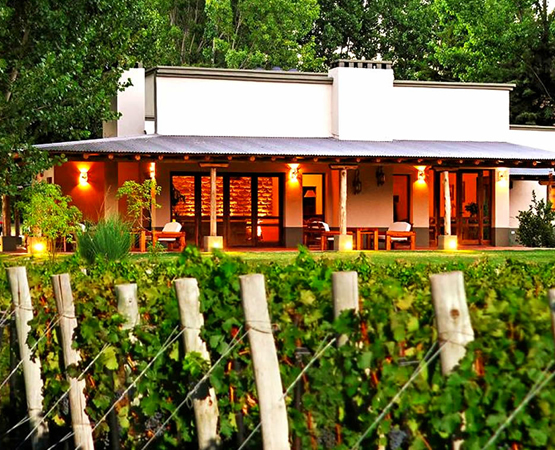 Algodon Wine Estates´ restaurant is characterized by the use of horno de barro, an oven built with clay, and the asador, a big grill, as cooking methods. The restaurant’s countryside style and its gallery situated in front of the Golf’s Driving Range create a warm and relaxed atmosphere. Its excellent service and the originality of its regional menu have been doubly awarded by the Great Wine Capitals for “the best winery restaurant” and “relevant wine experience”. With a incredible view of the region’s vineyards, fruit plantations and Sierra Pintada as a background scenery, Algodon Wine Estates has a new and spectacular 18- hole, par 72 (7,410) golf course. There is a pro-shop where golfers can rent golf cars or buy golf clubs or accessories. The Driving Range is in front of the Clubhouse & Restaurant where golf can be played or simply golf classes can be taken with specialized teachers. This new golf course is a new challenge that every golfer should face. 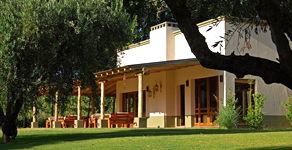 Club House: Located among our hundred-year-old olive trees, the Clubhouse was constructed using a combination of wood, stone, straw, and reed, to give it a true feel of rustic antiquity. Our Clubhouse is home to our renowned restaurant as well as our golf shop. Here you will experience the convergence of three distinct worlds; haute cuisine, estate grown wine, and golf. Jurado’s Golf Pro Shop offers the latest equipment and apparel, as well as club rentals. Our knowledgeable staff is always on hand to lend valuable advice regarding personalized fittings when purchasing new clubs. Algodon Wine Estates´ guests will have the possibility to visit the winery and learn everything about wine’s production. For those who wish to enjoy an interesting wine-tasting surrounded by the imposing scenery of the farm, the winery staff of professionals will be responsible of holding it. Winery: The building of our winery commenced in October 2002 under the supervision of a team that included engineers, architects and enologists (specialists in wine making). The first section was completed during March of 2003. Located at the heart of the estate, the winery sits eight hundred meters (2624.7 feet) above sea level and overlooks the vineyards and golf course. The winery is 350 square meters (3767 square feet) and has a vat capacity of 150,000 liters. The Elaboration and Conservation room lay at ground level, above an underground cave where the wine matures. We have designed our winery exclusively for the purpose of making world-class wines, but solely in limited quantities. This ensures our ability to implement all the care and attention necessary to obtain optimum results and the best product possible. Our careful quality control begins with the grapes and continues throughout the entire process, all the way up to the labeling. Grapes are harvested by hand and collected in small buckets; the resultant wine then matures in French and American oak barrels. Among our discriminative collection, we turn out micro wine production of the varieties Cabernet Sauvignon, Malbec, Merlot, Bonarda, Blend Rose and our very special Grand Blend. Craftsmanship and tradition, combined with the latest technology, allow us to obtain only the highest quality of wines. Our wines can only be found in the local markets in limited quantities, exported exclusively to a few select vendors, and of course right here at our winery for our own distinguished guests. Three hours. Highlights of the tour. This includes a detailed lesson regarding vineyards, varied types of planting, irrigation, climate, and the manual labor involved in maintaining a successful winery. If the season permits, you can experience first hand what some of the labor entails like pruning, shoot thinning, and harvesting…get ready to work! Here you will see and learn about the elaboration process of a handcrafted wine. Experience the base wines used for blending. This tasting includes detailed descriptions and evaluations of each varietal. Elaboration of a Blend: Once tasted and evaluated, the base wines will be combined by you to create your very own blend, then bottled and labeled for you to take home. The best blend will win a prize. Five hours) This seminar will include important lessons, introducing the combination of winemaking theory and practice, learning about viticulture, viniculture, tasting techniques, structure and components of wine, pairing and vocabulary. Consists of a detailed lesson regarding vineyards, varied types of planting, irrigation, climate and the manual labor involved in maintaining a successful winery. If the season permits, you can experience first hand what some of the labor entails like pruning, shoot thinning, and harvesting…get ready to work! Here you will see and learn about the elaboration process of a handcrafted wine. Again, if the season permits, you can experience first hand what some of the labor entails during the crushing process. A discussion about the history of wine, which includes perception and sensory analysis, proper tasting techniques and the classification of different types of wines. During lunch, prepared by our skilled chefs, you will learn about wine and food pairing, as well as serving hints. Includes wine descriptions, jargon and practices. Finish this seminar with a platter of smoked cuts, artisan cheeses and olives. 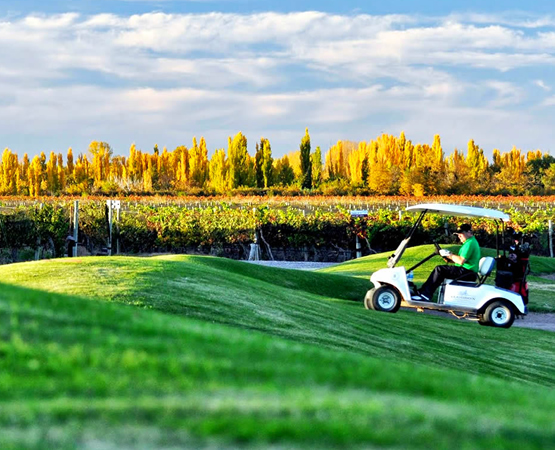 Algdon Wine Estates Viñas del Golf is situated to the southwest of the city of San Rafael in Mendoza, on the kilometer 674 of the National Route Nº 144. 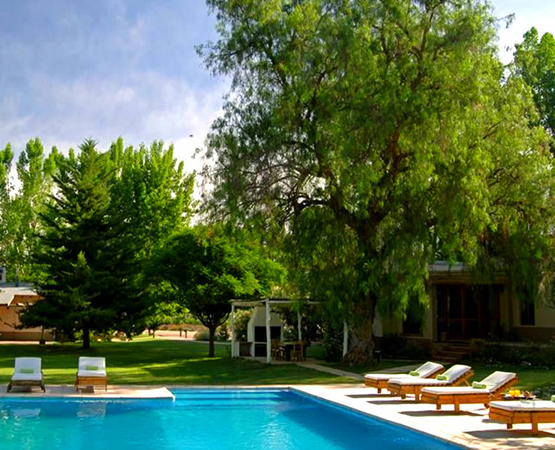 Located in the south of the province of Mendoza, San Rafael is situated 232 Km. from the capital city and 190 Km. from Las Leñas, one of the best skiing center of South America. Its nailed in the proximity of the rivers Atuel and Diamante, in the middle of beautiful landscapes of mountains, valleys, dikes and sun. Is the ideal place to live unforgettable experiences. The city has an airport with direct flight toward Buenos Aires. San Rafael, is not only cradle of poets, artists, painters and musicians but also very attractive for tourists by its natural beauties.